Fair to snappy score, piffling to predictable story and characters of cartoon depth. That about sums up the much-anticipated new musical based on the mordantly brilliant cartoons of Charles Addams. And oh yes, multi-million dollar whiz bang production values and a cast comprised of some of the biggest stars known to the biz of show. 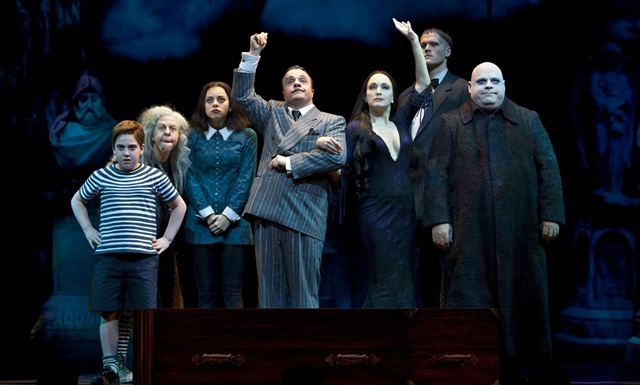 Minus Nathan Lane and Bebe Neuwirth – talents as brilliant in their fields as Addams was in his – would The Addams Family musical be worthy of its pre-Broadway hype? We’d argue ‘no,’ but that argument’s probably beside the point. 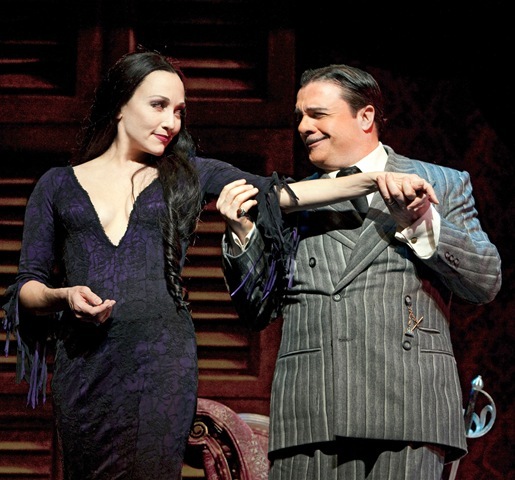 With Lane and Neuwirth as Gomez and Morticia Addams, the score and the book could be a creation of cringing mediocrity and nobody’d much notice. Lane can – and here, does – wrest belly laughs from jokes that would fall flatter than a week-old, lead-lined pancake if delivered by lesser lights. Neuwirth is his match as the slinky, femme-fatale mistress of the ooky-spooky mansion. 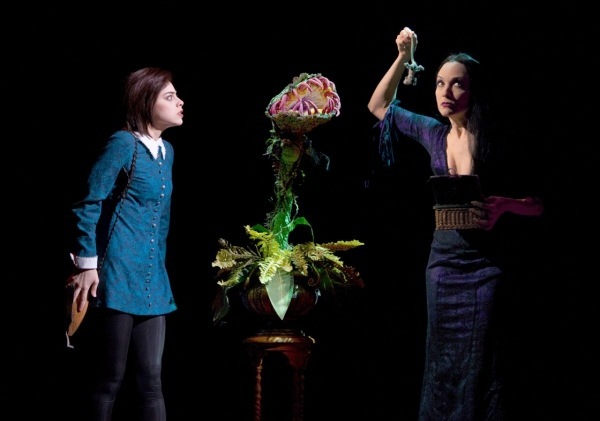 With legs and hair that go from here ‘til eternity and a whiskey-and-velvet alto voice that screams “come hither” even when it says something completely different, she simply kills it as Morticia. As for the story that contains these luminaries, think “You Can’t Take It With You” with ghosts and monsters. Marshall Brickman and Rick Elice’s book focuses on Wednesday Addams (Krysta Rodriguez, instilling Wednesday with a definite S & M flair) and her romance with the comparatively normal Lucas Beineke (Wesley Taylor, the clean-cut ‘M’ to Rodriguez’ domineering ‘S’). As in Kaufman and Hart’s depression-era classic, the romance is complicated by clashing parents. Lucas’s folks are prim, proper and repressed. The Addamses? Not so much. 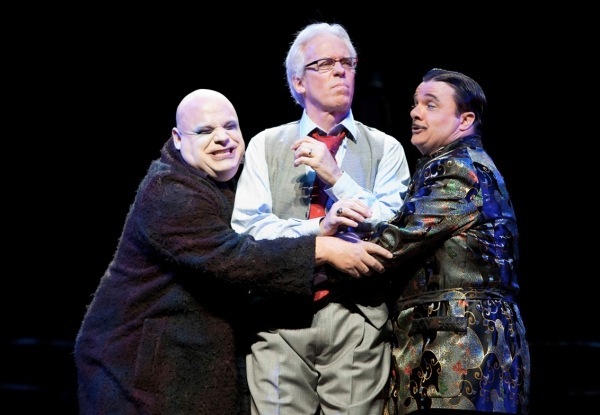 Wackiness ensues when the buttoned-up Beinekes are confronted with the questionably alive Lurch (Zachary James, a literally towering presence whose basso profundo steals the show in the finale) upon entering the Addams’ Central Park manse. It ensues further as the Beinekes contend with lovesick sea-monsters, chairs that double as castration devices, saber-rattling ghosts and hosts and the shamelessly demonstrative lustful affection between Morticia and Gomez. Andrew Lippa’s score is colored throughout by Gomez’ Spanish ancestry. Its flamenco/tango stylings are serviceable, but in all, the music is more flash than depth. Curiously, the best songs don’t go to Lane or Neuwirth. The latter’s big number comes with “Second Banana”, an utterly forgettable lament about aging. Lane gets “Happy/Sad,” a second act crooner that is sweet but generic. 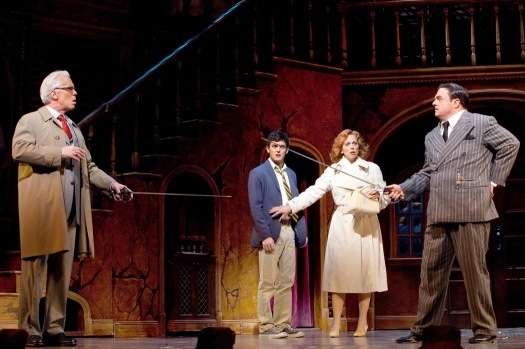 It is Mrs. Bieneke (Carolee Carmello, a belter of deceptively mousy demeanor) who gets the Act I showstopper (“Waiting”) and Mr. Bieneke (Terrence Mann, in fine voice) who raises the roof and brings down the house in Act II with “In the Arms,” a hilarious ode to cephalopod love. As for the big 11 O’Clock penultimate finale, that has more to do with swashbuckling spectacle and an all-hands-on-deck sword fight than with musical virtuosity. 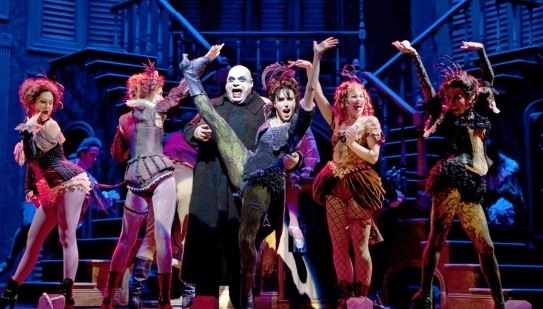 (Choreographer Sergio Trujillo draws a page from “Thriller” for much of the rest of the show, as a chorus of the dead engages in lively dances with gravestones. ) If you’re waiting for a star turn (a la The Producers “Betrayed”) that puts Lane’s incandescent leading man capabilities in the white-hot light they deserve, it never arrives. As far as the score is concerned, Lane’s role is oddly underwritten. Director/designers Phelim McDermott and Julian Crouch have crafted a show that looks thrilling and moves at a spirited clip. That’s all well and good – but hardly the stuff of a deserving Broadway blockbuster. Fans of the 1960s “Addams Family” television series will find all the show’s deliciously macabre eccentricities in place. Cousin Itt makes an appearance. “Thing” is featured prominently. Fester (an infectiously gleeful Kevin Chamberlin) serves as both narrator and odd-man Greek chorus of sorts. Ukulele in hand, he gets some of the evening’s most creative special effects (and amusing choreography) in a free-floating love song to the moon. 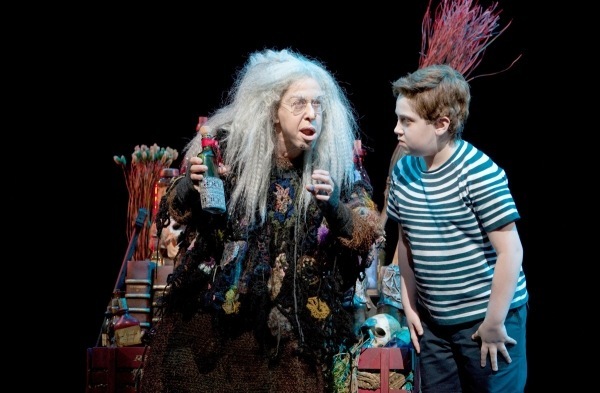 And as Grandma, Jackie Hoffman makes the mighty most of a small part, delivering the show’s best lines with a pitch-perfect irreverence that stops the show with every punchline. 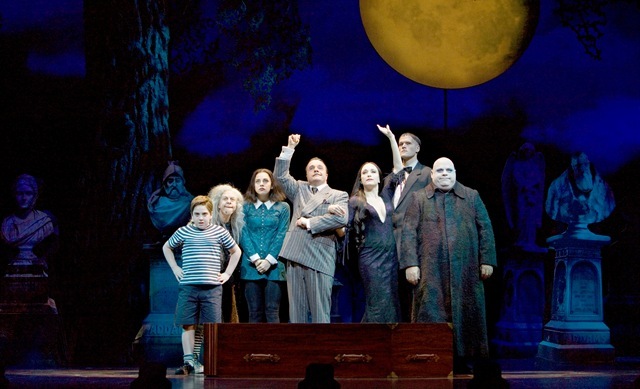 For boomers who loved the finger-snapping show, The Addams Family is a must. Ditto for those who treasure any chance to see Lane and Neuwirth perform live. For the rest, there’s just not much there.